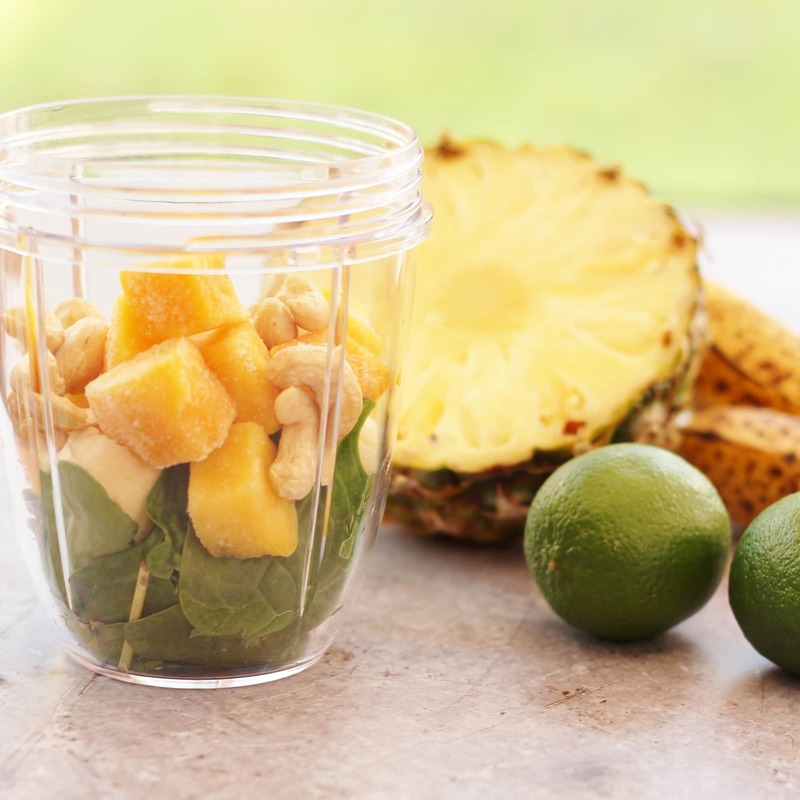 A delicious, tropical tasting smoothie with a hidden portion of spinach, giving it a wonderful green colour, this Pineapple, Mango, Coconut and Cashew Nut Smoothie makes a great quick and healthy breakfast or mid-afternoon pick me up. I have been really getting into smoothies lately – I know, I am seriously late to the party!! But wow – smoothies are so awesome. They are quick and easy to make but taste amazing – and such a great way to get some extra fruit and veggies into my diet – and the kids too! I do try to eat my 5 a day – and encourage the kids to as well – and we usually get up to 3 or 4, but getting to 5 a day is sometimes a real challenge. And I know really we should be eating even more than that. 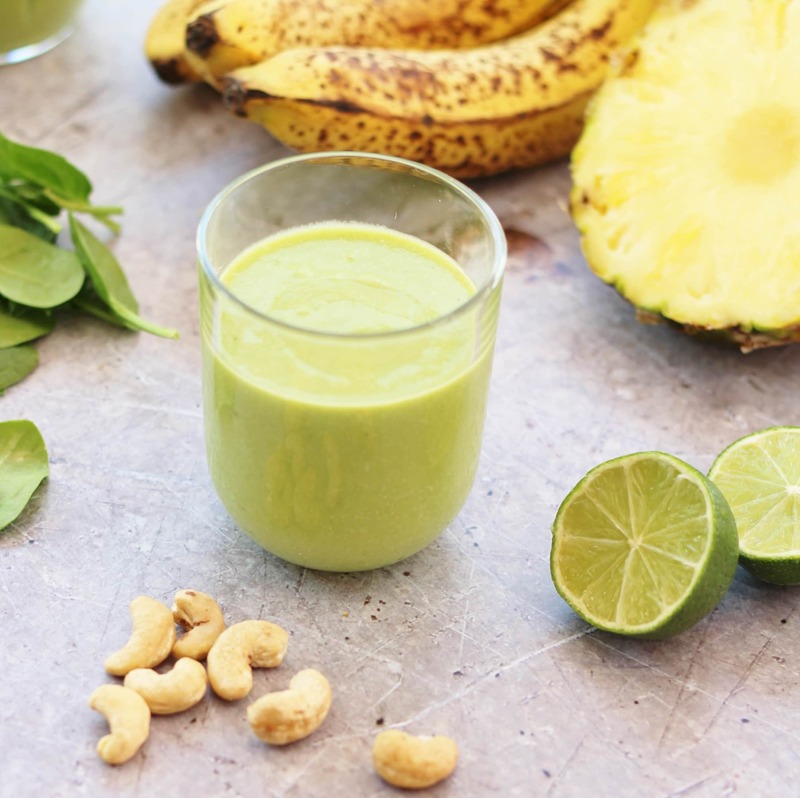 This smoothie is absolutely jam packed with fruit and veg, not to mention milk and nuts, making it a really great way to get extra vitamins and other nutrients into the kids, and keeping them going until dinner. It’s also a super fun family bonding activity (eurgh – did I just say family bonding???). I love cooking with my kids, but there are just some days when I don’t have the time or energy to make a cake after school, not to mention the clearing up afterwards – making a smoothie together is just as fun, but a lot less time consuming and a lot less mess. Plus the end result is a healthy concoction of fruit, veg, nuts and milk, not a refined carb and white sugar fest!! 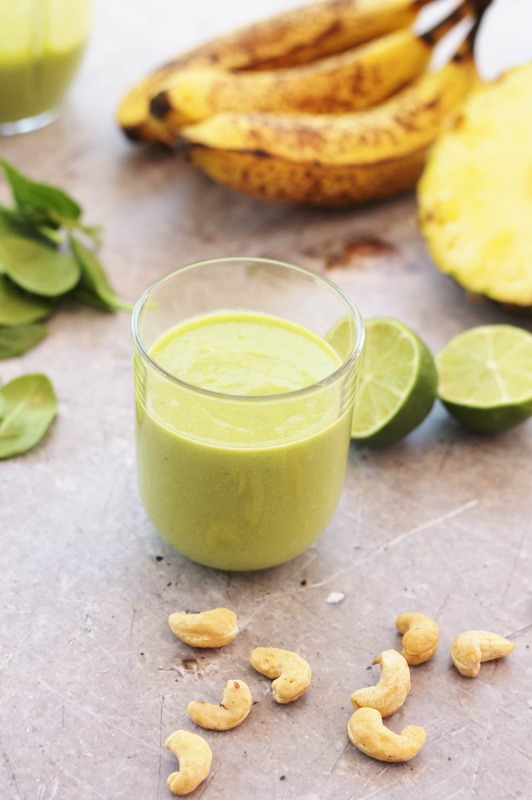 The kids absolutely love coming home and making smoothies too – perhaps it’s the novelty and maybe it will wear off, but at the moment they are super excited by the idea. And they love being able to make decisions about what goes in there. 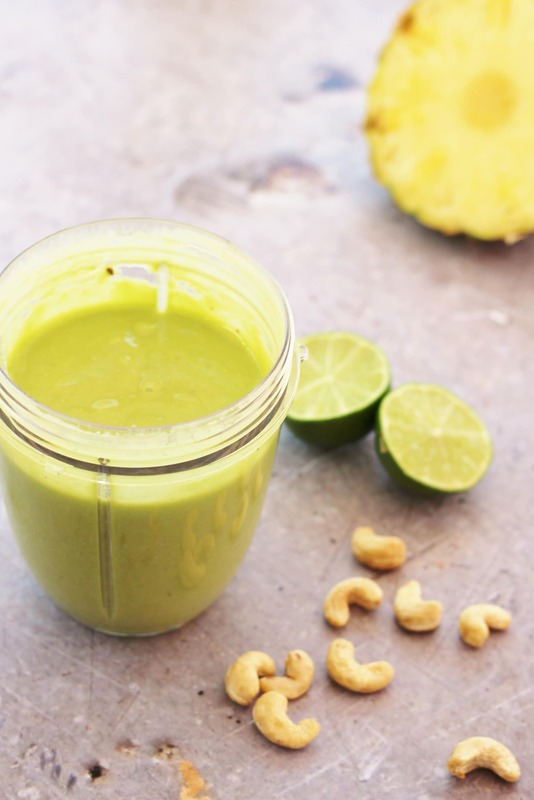 And we’ve tried all sorts of flavour combinations, but my absolute favourite has been this delicious tropical green concoction: a mix of pineapple, banana, mango, spinach (you can’t taste it), cashews and coconut milk. It’s creamy, sweet enough not to need any additional sweetener, and totally delicious. Plus it’s properly easy peasy – it takes all of 5 minutes to make and even less time to drink, making a great easy breakfast for a day when you are in a hurry – a fun afternoon snack for the kids, or even a healthy pudding. 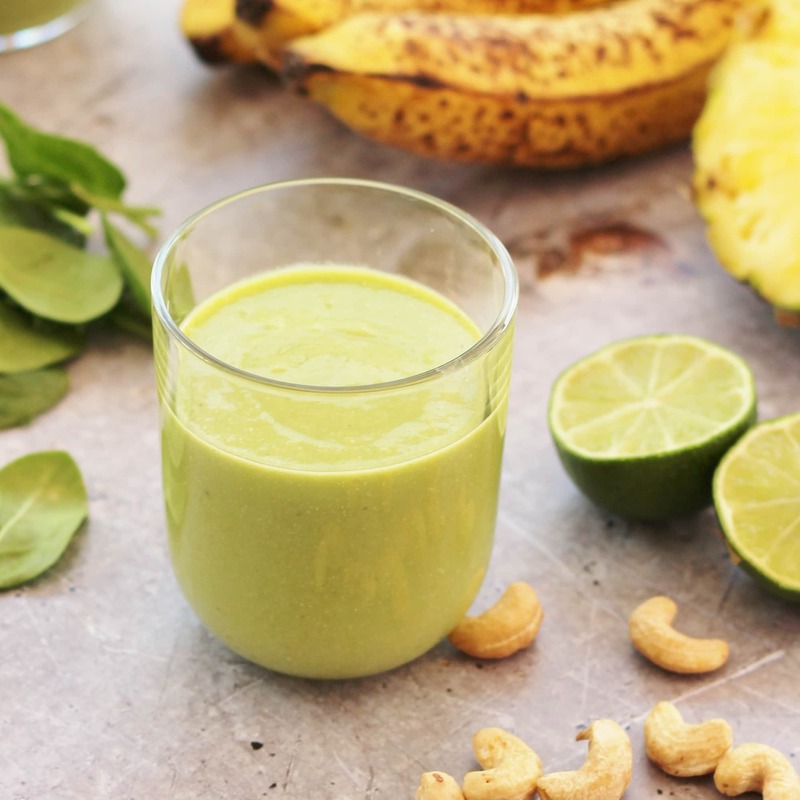 You could use any kind of milk in this smoothie – but I like Rude Health’s Coconut Drink – it’s less cloying than regular coconut milk – plus the ingredients are not scary (have you seen the ingredients on the average tin of coconut milk???) and the delicate coconut flavour compliments the other tropical flavours in the smoothie. I also like how it comes in a carton, not a tin, so I can just use as much as I need and then pop the rest in the fridge easily. I am now seriously on the hunt for more smoothie inspiration – what’s your favourite combo? 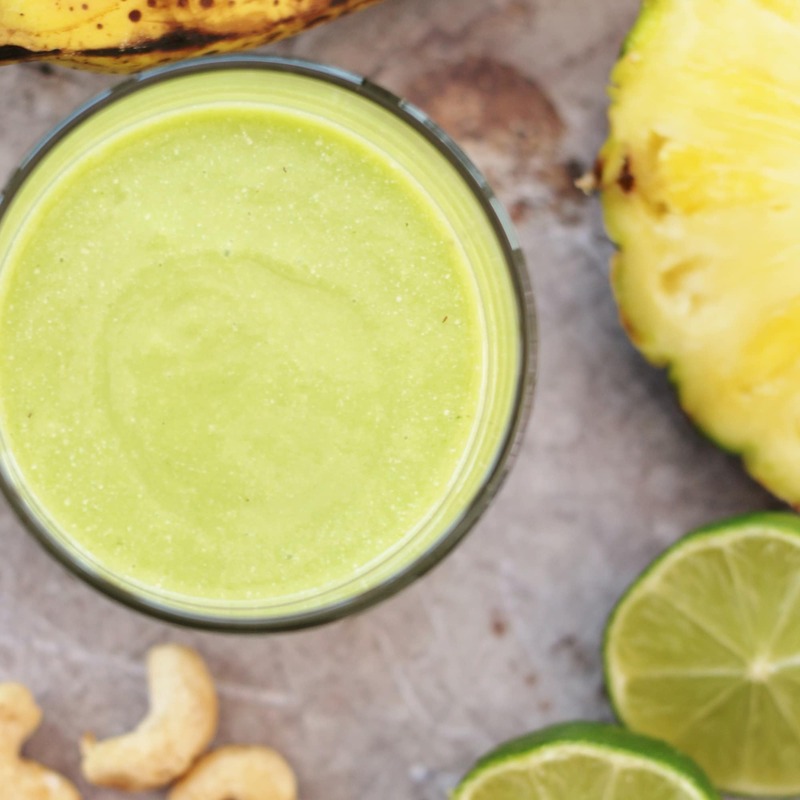 A delicious, tropical tasting smoothie with a hidden portion of spinach, giving it a wonderful green colour, this Pineapple, Mango, Coconut and Cashew Nut Smoothie makes a great quick and healthy breakfast or mid-afternoon pick me up! Place all the ingredients into in a high speed blender or smoothie maker and whizz until smooth. This serving would do two for breakfast or four if it was a snack or a dessert. Yum! What a fab colour it turns out! 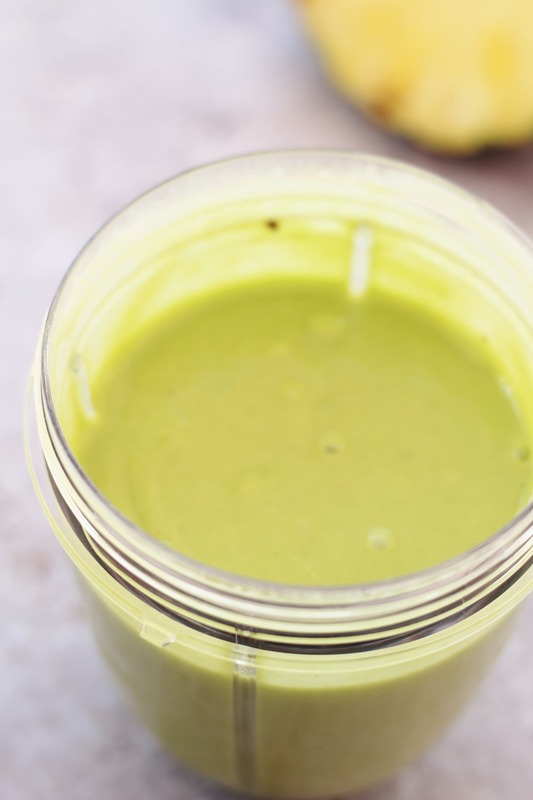 Everyone seems to be blogging smoothies this week……. well….. maybe not everyone, but I have seen a lot of them in all colours and flavours in my dashboard reading list! 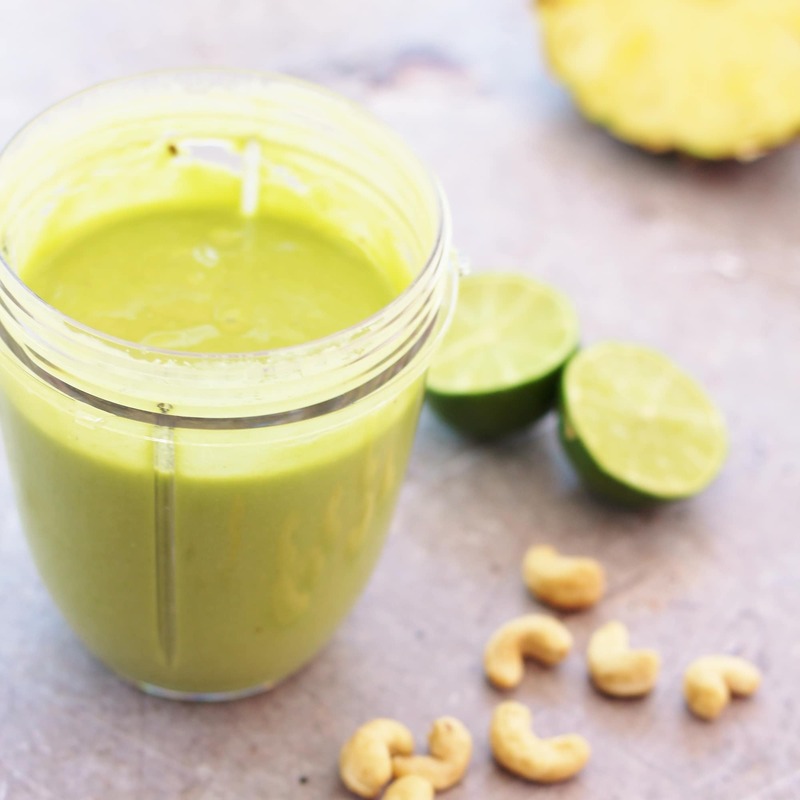 I am a HUGE fan of smoothies too, but rarely blog them (although I often think I should). Trouble is that I make them as I dash out of the door to my ‘day job’, and drink them in my first meeting of the day or at my desk….. not the ideal environment to start a photo-shoot! I can just imagine some of the comments I would get if I started taking pics….. I would probably lose my job!